Most often understood as an acronym for “comma-separated values” (though sometimes called “character-separated values” because the separator character does not have to be a comma), CSV is a file format that stores tabular data in plain-text form. Information with common properties that can be expressed as a sequence of fields sharing a common header can be stored in plain-text using the CSV format, making it application agnostic and highly transportable. A CSV file consists of a number of records (rows), that have identical fields, separated by commas (or in some cases, another separator). Often a header column (i.e. the cell values in first or top row of a CSV file) is included, naming each column and indicating what kind of data the column contains. Data is then entered using a separator or delimitor (such as a comma) to indicate a separation of fields (or cells), and a line break or carriage return to indicate rows (i.e. different records). Most spreadsheet applications (such as OpenOffice Calc or MS Excel) can open CSV files and express them as a spreadsheet. See Wikipedia for more information on CSV. In AtoM, the CSV import function allows user to import data from a spreadsheet, or another database (so long as the export from the database is made to conform with the AtoM CSV template format). 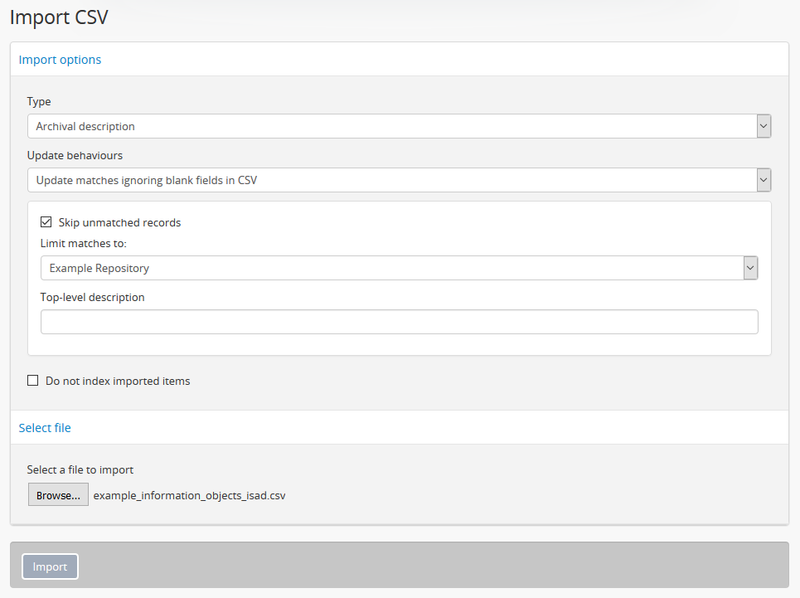 Artefactual has created a number of CSV templates that can be used to import various different entity types. AtoM expects the column headers used in the templates and imports that do not conform to this pattern will fail or cause unexpected results. CSV imports peformed via the user interface in AtoM are are executed as jobs and performed asynchronously in the background to avoid timeouts in the web browser. Jobs in AtoM are handled by Gearman, and the status of AtoM jobs can be seen in the user interface via the Manage > Jobs page. For more information, see: Manage jobs and Asynchronous jobs and worker management. In addition to importing new records, AtoM can also attempt to identify matches on existing records and either update them in place, or delete the matches before importing the new records as replacements. This functionality will be described in greater detail below, along with other import options. Before you start importing records, there are a number of things you’ll need to do to prepare. You’ll likely want to determine import complexity to see how much technical resources need to be allocated and you’ll want to make modifications to your import data to ensure that it imports properly. Below are some guidelines to help you prepare your data for import into AtoM via CSV. We strongly recommend that imports never be carried out in your production environment, if possible. Instead, consider deploying a development/test version of your AtoM instance, performing the import(s) there, reviewing the data for any problems and making any required edits via the user interface, and then migrating this data to your production server. For more information, please see our section on Server migration in the Administrators manual. You will need access to the command-line of the server on which AtoM is installed, and you will need to know the file path where your CSV is currently located. Run the command from the root directory of your AtoM install. AtoM was originally built to encourage broad adoption and use of the ICA’s international standards, and expanded to support other recognized standards. Consequently, all of the description templates in AtoM correspond to a recognized content or metadata exchange standard, and many of the fields in our underlying database model are also inspired by ICA standards. For your data to import successfully into AtoM, you will first need to map it to one of our existing CSV templates, which are derived from the various standards-based templates available in AtoM for description. Mapping your data to the supplied CSV templates below implies a familiarity with the standards used in AtoM, so you can make appropriate decisions on which fields in your data map to which fields in AtoM, and how to proceed if your data does not easily map 1:1 with the standard upon which our templates are based. The cell values in the top row of a CSV data file conventionally name each column. The name indicates what kind of data the column contains. If the CSV data you wish to import doesn’t include a row like this, you should insert one. You should then make the names correspond to AtoM-friendly names using the top row of data in the example CSV file(s) appropriate to your import. You can also find all example CSV import templates included in your AtoM installation, in: lib/task/import/example. The order of the columns in the example CSV files is the same as the order in the AtoM interface, and should be maintained. Having the correct names in the cell values of the first row of your CSV data enables AtoM to import values in each column to the correct AtoM fields. A good way to make sure your column mapping is correct is to create a blank row after the top row and populate this with test values. You can then do an import, stop it after the first row (using CTRL-C), and make sure that all the values from the CSV row are present in AtoM. Including, in each field of a row, the letter corresponding to the corresponding spreadsheet column (including, for example, the text “(A)” for data in spreadsheet column A) makes it easy to quickly determine if a field is showing up on the AtoM side after import. For your CSV files to import properly, you will need to ensure two things prior to importing: that the character encoding of your CSV file is set to UTF-8, and that the end-of-line characters used in your CSV conform to the Unix/Linux style of newline character. Your import will likely fail if you don’t ensure these two things are are correctly set prior to import! Please review the sub-sections below for further details. For a CSV file to upload properly into AtoM (and display any special characters such as accents contained in the data), your CSV file must use a UTF-8 character encoding. If you have used a Windows or Mac spreadsheet application (such as Excel, for example), it’s possible that the default character encoding will not be UTF-8. For example, Excel uses machine-specific ANSI encoding as its defaults during install, so an EN-US installation might use Windows-1252 encoding by default, rather than something more universal such as UTF-8 (the default encoding in AtoM). This can cause problems on import into AtoM with special characters and diacritics. Make sure that if you are using Excel or another spreadsheet application, you are setting the character encoding to UTF-8. Many open source spreadsheet programs, such as LibreOffice Calc, use UTF-8 by default, and include an easy means for users to change the default encoding. AtoM’s CSV import will expect Unix-style line breaks ( \n ). If you have been using a spreadsheet application (such as Excel) on a Mac or Windows, you may encounter import issues. There are many command-line utilities and free software options out there to convert newline characters. Please ensure that your spreadsheet is using the correct line endings prior to upload, otherwise the upload will fail. If you are working with a CSV export from another system (such a different database), you may need to do further pre-processing to prepare your CSV. If your previous system was designed for standards-compliance to a standard that AtoM supports (see: Descriptive standards), the mapping process might be simple - but if your system used custom data fields, mapping to one of the supported standards could be trickier. You may, for example, want to combine multiple CSV column values, that don’t cleanly map conceptually to AtoM-compatible CSV columns, into single columns so they can be put into AtoM as notes. So ColumnA and ColumnB could be combined into a generalNote column. This requires you to transform the data before importing. Depending on the size of your import data, this work can be done manually using a spreadsheet program - simply cut and paste your data into the corresponding cell in the provided import templates. However, for larger data sets, data transformation can be done with custom programming (for example, a Python script written by a developer), existing tools such as the open source Pentaho Data Integration application, or by use of a CSV transformation script. Creating custom CSV scripts is an activity generally performed by a developer. Once you’ve mapped the columns names in your CSV export to the corresponding AtoM-compatible CSV column names you may wish to perform a test import. A test import gives you an idea how long the import will take to complete on your hardware. To estimate how long it will take to import 20,000 rows of CSV data, for example, you could time the import of the first 1000 records and multiply that by 20. If your test import proves to be too slow on your hardware, or you don’t have hardware to spare, you can consider using cloud computing resources, such as Open Hosting, Amazon EC2, or Rackspace Cloud. Once you’ve prepared your import, you may want to clone your AtoM site and test your import on the clone before importing to your production AtoM installation. This prevents you from having to delete any improperly imported data. During import testing if you want to delete all imported data you can use the command-line purge tool. See: Purging all data in the Administrator’s manual for more information. A representation of the keymap table in AtoM, from an Entity Relationship Diagram of AtoM’s MySQL database. The legacyId column in imports is used to associate specific legacy data to AtoM data using ID columns. Why would you need to associate this data? Let’s say you’re importing a CSV file of description data you’ve exported from a non-AtoM system. If the imported descriptions are in any way hierarchical – with a fond containing items for example – a column in a child description will have to specify the legacy ID of its parent. The parent’s legacy ID can then be used to look up the AtoM ID of the parent that was imported earlier. With the AtoM ID discovered, the parent/child relationship can then be created. In addition to hierarchical description data, supplementary data such as events must specify a legacy parent ID when imported. When CSV data is imported into AtoM, values in the legacyID column are stored in AtoM’s keymap table, in a column named source_id. A system administrator or developer can access this information, either via the command-line, or by using a graphical application such as phpMyAdmin to look up exising legacy ID values in the source_id column of the MySQL keymap table. Even if you are importing your descriptions as top-level records, we still recommend using a legacyId value during import. Simply leave both the parentID and qubitParentSlug columns blank for any row you want to import as a top-level description. In cases where data is being imported from multiple sources, legacy IDs may conflict. Two datasets, for example, may have objects with an ID of 3. When importing, you can use the command-line option --source-name to only record or reference mappings for a specific data source. This will add a value in the source_name column of AtoM’s keymap table, which can then be used for mapping subsequent imports. There is no way to set the --source-name during an import conducted via the user interface. Instead, the file name of the import is used as the source name value by default. php symfony csv:import information_objects_rad.csv --source-name="collection name"
The --source-name option can also be used to keep larger imports that have been broken into multiple CSV files related. Adding the --source-name option to each CSV import, with a common name added for each, will prevent AtoM from duplicating import data, such as terms and actors (authority records) during import. The following section will introduce some of the relevant CSV columns so you can prepare your archival descriptions for import. Information objects often have parent-child relationships - for example, a series may be a child of the fonds to which it belongs; it has a parent fonds. If you want to import a fonds or collection into AtoM along with its lower levels of description (i.e. its children - series, files, items, etc. ), you will need a way to specify which rows in your CSV file belong to which parent description. There are two basic ways to specify which information object is the parent of an information object being imported in your CSV - either through the use of the legacyID and parentID columns (generally used for new descriptions being imported, or from descriptions being migrated from another access system), or by using the qubitParentSlug column to import new child descriptions to an existing description in AtoM. Note that if you set both the parentId and qubitParentSlug in a single row, the import will default to using the qubitParentSlug. In general, only one type of parent specification should be used for each imported information object (i.e. each row in your CSV). You can use a mix of legacyId/parentId and qubitParentSlug in the same CSV, just not in the same row. So, for example, if you wanted to import a series description as a child of a description already in AtoM, as well as several files as children of the series description, you could set a legacyID for the series, use the qubitParentSlug to point to the parent fonds or collection already in AtoM, and then use the parentID column for all your lower-level file descriptions. However, using both parentID and qubitParentSlug in the same row will cause a conflict, and AtoM will prefer the qubitParentSlug so the import does not fail. Both methods of establishing hierarchical relationships are described below. If you want your records to import as top-level descriptions, simply include a legacyID value, and leave both the parentID and qubitParentSlug columns blank for that row. One way to establish hierarchical relationships during a CSV import involves the use of the parentId column to specify a legacy ID (referencing the legacyId column of a previously imported information object). This way is most often used for migrations from other access systems. Using this method, parent descriptions (e.g. fonds, collections, etc) must appear first (i.e. above) in your CSV and must include a legacyID - while child records must appear after (i.e. below) their parent records in your CSV, and must include the legacyID of the parent record in the parentID column. When the CSV is imported, it progresses row by row - meaning, if your CSV is not properly ordered with parent records appearing before their children, your import will fail! Records in a CSV are imported sequentially, row by row. As each row is imported, the legacyID value is added to AtoM’s keymap table in the database. When a parentID is encountered, AtoM will check the keymap table for the corresponding legacyID. If a parentID value doesn’t refer to the legacyID of a previously imported description, AtoM’s import logic will fall back to check for an existing description with that internal object ID. If there is still no match, then a warning will be included in the console output (shown on the Job details page), and the record will be imported as a top-level description. Be sure to double-check the results post-import! The other method of importing hierarchical data into AtoM enables you to specify an existing archival description that doesn’t have a legacyID (one, for example, that has been manually created using the AtoM web interface), and import descriptions as children of the target description(s). To specify a parent that exists in AtoM, you must first take note of the parent information object’s slug. The “slug” is a textual identifier that is included in the URL used to view the parent description. If the URL, for example, is http://myarchive.com/AtoM/index.php/example-fonds then the slug will be example-fonds . This slug value would then be included in your import in the qubitParentSlug column in the rows of children of the parent description. Alternately, if you are using the command-line to perform your import, you can use the --default-parent-slug option in the command-line to set a default slug value, that will be used when no qubitParentSlug or parentID values have been included for the row. For more information, see the details in the Administrator’s manual on command-line CSV export: Importing archival descriptions. If desired, you can mix the use of the qubitParentSlug column with the use of the parentID column in the same CSV - for example, you could attach a new series to an existing fonds by giving it a legacyID and the slug for the existing fonds in the qubitParentSlug column, and then including lower-level files attached to the new series by adding the legacyID of the new series to the parentID column of the new files. You should not add both a parentID and a qubitParentSlug to the same row - AtoM expects one or the other. When the import encounters both columns populated in a single row, AtoM will default to use the qubitParentSlug value. In general, each row must have only one or the other - either a parent slug, or a parent ID. 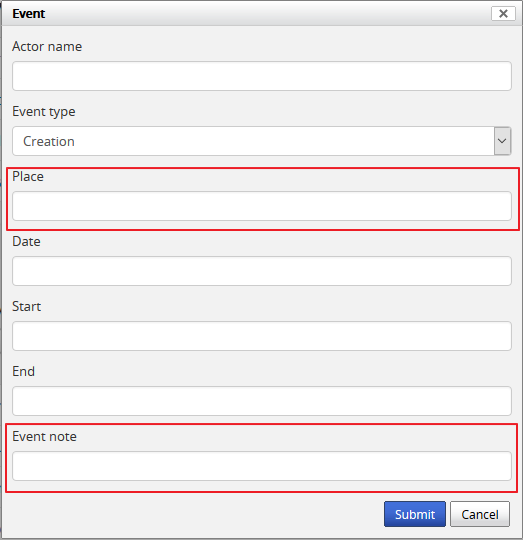 The eventActors, eventActorHistories, eventTypes, eventDates, eventStartDates, and eventEndDates columns are related to the creation of actors and events. In AtoM’s data model, an archival description is a description of a record, understood as the documentary evidence created by an action - or event. It is events that link actors (represented in AtoM by an authority record) to archival descriptions - see Entity types for more information. The most common use for these columns is to add creation dates associated with an actor via an authority record - in this case, the eventType is Creation, the eventActor is the creator, and the various eventDates fields are the dates of creation associated with the description. However, some standards support other types of events as well. For example, the ISAD(G) template in AtoM also supports Accummulation as an event type, while the Canadian RAD template allows direct association between actors and events, and includes many other event types, such as contribution, broadcasting, manufacturing, and more. eventActors: Add the associated creator or other actor name here. AtoM will link to an existing authority record or create a new one. For details on linking behavior, see below: On Authority records, archival descriptions, and CSV imports. eventActorHistories: Add the associated creator or other actor’s administrative or biographical history here. Equivalent to ISAD(G) 3.2.2, RAD 1.7B, and/or DACS 2.7 - Administrative/Biographical history. This will be mapped to the related authority record. archival description view page. May use free-text, including typographical conventions to express approximation or uncertainty (e.g. [190-? ]; [ca. 1885]). eventPlaces: Only in RAD CSV templates. Associates a place with the event. If multiple actors/events exist for an information object, the values in these fields can be pipe-separated (e.g. using the | pipe separator between values). AtoM looks for creator names in the eventActors column in the RAD and ISAD CSV import templates, as well as access point names (used as subjects) in the nameAccessPoints column during a CSV import of archival descriptions. Similarly, any Administrative / biographical history data in an archival description CSV import (i.e. data contained in the eventActorHistories CSV column will be mapped to the “History” field (ISAAR-CPF 5.2.2) in the related authority record (generated from the data contained in the creators column of the CSV), and then is presented in AtoM in any related descriptions where the entity is listed as a creator. Where multiple creator names and histories are included in an import, eventActors and eventActorHistories elements are matched 1:1 in the order they appear in the CSV, divided by pipe elements (e.g. | ). For example, if the eventActors column contains name 1|name 2, the eventActorHistories should also include history 1|history 2 to match on import. If there is no history for the first actor, you can include NULL, and AtoM will ignore the imput - e.g. name 1|name 2 should be matched with NULL|history 2 to include only a history for name 2. If a creator history element is included in a CSV import, but no creator name is included, AtoM will still automatically generate a stub authority record and map the history data to the “History” field (ISAAR-CPF 5.2.2) - the authority record will be left untitled, until the user manually adds the appropriate name to the authority record. Similarly, if there are more eventActorHistories elements included in an import than creator names included in the creators column, the final biographical/administrative history will be mapped to an untitled authority record. Because the slug is normally based on the title of the authority record, AtoM will generate a random alphanumeric string to use as the slug - and you will not be able to edit this through the user interface. If you are attempting to import both an archival description CSV and an authority record CSV to supplement the actor data that is linked to your descriptions, you must import the authority record CSV first. On import, the description CSV code will look for exact matches to which it can link - but the authority record CSV import code does not currently have similar logic. If you import your authority record CSV template after the description CSV, you might end up creating duplicate authority records! During an archival description CSV import, AtoM will attempt to find matches for current authority records, and link to those instead of creating new ones during import when possible. However, to avoid collisions, or situations in which multiple imports overwrite the same authority record in a multi-repository system, the approach is conservative - for a match to be made and a link to an existing record added instead of a new record being created, the authorized form of name must bean exact match, and the existing authority record in AtoM must be linked to the same repository as the incoming records’ repository column value. The presence of a matching or different actor history, and the import type (import as new, match and update, or delete and replace) can also affect how actor linking behaves during a CSV import. This means that users should be careful to double check authority linking behaviors in AtoM following an import, and manually perform any desired adjustments where needed. For more information on linking an authority record to a repository, see: Link an authority record to a repository as its maintainer. For more information on the different types of imports, see below. Below is a table summarizing the actor matching behavior on CSV imports of archival descriptions. It is followed by an explanation of the columns. Import type: AtoM’s CSV import supports 3 modes - import a record as new (ignore any matches found); find matches and update the record in place; or find matches, delete the existing record, and import the current record as a replacement. See more on how to use these options below. Match on name: Whether or not the CSV row’s eventActors value matches the existing authority record’s authorized form of name. Match on repository: Whether or not the CSV row’s repository value matches the Maintaining repository linked to the existing authority record. AtoM includes the ability to link an authority record directly to a repository, and this is used as a match parameter during import. For more information on linking authority records to a repository, see: Link an authority record to a repository as its maintainer. Note that during match and update imports, a blank value in a CSV is ignored (the original data is not modified) - hence “Yes (or blank)” as a response in some cases. Match on history: Whether or not the CSV row’s eventActorHistories value matches the biographical or administrative history associated with the existing authority record. Note that during match and update imports, a blank value in a CSV is ignored (the original data is not modified) - hence “Yes (or blank)” as a response in some cases. Outcome: Based on the variables in the other columns, whether or not the CSV import will result in linking to an existing authority record (and whether or not any parts of the authority record is updated), or if a new actor is created by the import instead. 1: If you are importing a CSV and there is a match to an existing authority record’s authorized form of name, history, and the repository the existing authority record is linked to matches the repository in the CSV for the related description, then AtoM will link to the existing authority record. 2A: If you are importing new records or trying to update existing ones using “Delete and replace” and there’s a match on authority record name AND maintaining institution BUT NOT on the admin/bio history, AtoM will create a new authority record, instead of overwriting the match’s existing history. If you wanted to update the existing admin/bio history instead, use the “Match and update” option instead. 2B: If you are trying to update existing descriptions using the “Match and update” option and there’s a match on authority record name AND maintaining institution BUT NOT on the admin/bio history, then AtoM will link to the existing authority record but update the current admin/bio history to the data included in the CSV. If you don’t want this to happen, you can either exclude the admin/bio history (in which case, no changes will be made to the linked authority record) or use the “Delete and replace” import option instead (in which case a new authority record will be created). 3: If you are importing new descriptions or trying to update existing ones and there’s a match on an authority record’s name AND the history is either blank or also matches exactly on the existing authority record, BUT the maintaining repository does NOT match (or is blank on the existing authority record), then AtoM will link to the existing authority record without making any changes to it. 4: If you are importing new descriptions or trying to update existing ones and there’s a match on an authority record’s name BUT neither the repository NOR the admin/biog history matches, then a new authority record will be created (to avoid overwriting another institution’s history). If you want to link to an existing authority record, omit the history from your CSV import or make it exactly match the existing one. 5: If you are importing new descriptions or trying to update existing ones and there is NO match to any existing authority records on the authorized form of the name of the actor in your import CSV, then AtoM will create a new authority record on import. You cannot use the descriptions CSV import to update the authorized form of name of a linked authority record. Even with the “Delete and replace” update option only the related archival description is deleted - existing authority records and other entities (e.g. access points, etc) are not automatically deleted. If you have created a new authority record, make sure you remember to manually delete any superceded versions! As of AtoM 2.1, two new columns have been added to the ISAD and RAD CSV import templates: digitalObjectPath and digitalObjectURI. These columns will allow you to link or upload a digital object and attach it to the new information object being created in that row of the CSV. In AtoM, a 1:1 relationship is maintained between information objects and digital objects - meaning that for every archival description, you can only attach one digital object. If you wish, you can create new child records - a number of item descriptions as children of a file-level description; a number of part descriptions as children of an item (for multiple views of a single object, for example, or individual pages of a single book uploaded separately, etc), and so on. In the CSV templates, the digitalObjectPath and digitalObjectURI columns are positioned after the publicationStatus column, and before the physical object-related import columns. The digitalObjectPath column can be used to upload local digital objects - simply provide a complete path and filename to the digital object. The digitalObjectURI column can be used to link to externally hosted, publicly available digital objects, such as those available at a specific URL on the web. You must have a path directly to the digital object which includes a file extension, and not just to a web page with a digital object located on it somewhere - it is often the equivalent of right-clicking on a digital object in your browser and selecting “View image”. You can use a mixture of the digitalObjectPath and digitalObjectURI columns throughout your CSV (linking some information object rows to locally uploaded digital objects, and others to web-based resources), but you cannot use both columns in the same row. If AtoM encounters a CSV row where both the digitalObjectPath and digitalObjectURI columns are populated, it will favor the digitalObjectURI value, and ignore the digitalObjectPath value. The physicalObjectName, physicalObjectLocation, and physicalObjectType columns are related to the creation of physical objects and physical storage locations related to an archival description. For more information on working with physical storage in AtoM, see: Physical storage. If your CSV import contains physical storage information, the CSV file must contain information in both of the physical object storage fields: physicalObjectName and physicalObjectLocation. Entering information in physicalObjectName only will result in the creation of duplicates, since AtoM defaults to duplicates rather than accidentally merging separate records with the same location. For example, several collections may contain physicalObjectName Box 1, but adding physicalObjectLocation Shelf 1 will differentiate it from Box 1 on Shelf 5. Most fields in the CSV template have been named in a fairly obvious way, translating a simplified version of the field name in our data entry templates into a condensed camelCase. For example, the Rules for Archival description’s General Material Designation is rendered in the CSV header as radGeneralMaterialDesignation. In both the RAD and ISAD templates, the Scope and Content field is marked by the CSV header scopeAndContent. However, for users seeking a full mapping of fields, consult the RAD template and ISAD template pages for further details. The culture column indicates to AtoM the default language of the descriptions being uploaded. This column expects two-letter ISO 639-1 language code values - for example, “en” for English; “fr” for French, “it” for Italian, etc. See Wikipedia for a full list of ISO 639-1 language codes. language and languageOfDescription, like culture, expect two-letter ISO 639-1 language code values - for example, “en” for English; “fr” for French, “it” for Italian, etc. See Wikipedia for a full list of ISO 639-1 language codes. Unlike the culture column, however, these two fields will accept multiple values separated by a pipe character - for example, en|fr|it. The script and scriptOfDescription columns expect four-letter ISO 15924 script code values - for example, “Latn” for Latin-based scripts, “Cyrl” for Cyrillic scripts, etc. See Unicode for a full list of ISO 15924 script codes. Alternative identifiers and their display labels can be imported using the alternativeIdentifiers and alternativeIdentifierLabels columns. Use pipe (|) separators to add multiple values. There should be a 1:1 relationship between the number of identifier values in the alternativeIdentifiers column and corresponding labels in the alternativeIdentifierLabels column. An accessionNumber column can be added to create a link between an existing accession record and an archival description being imported via CSV. See the section on Accession CSV import below for more information. The following section will introduce how an archival description CSV of new records can be imported into AtoM via the user interface. AtoM also has the ability to use a CSV import to update existing descriptions - for more information on this, see below. When importing new records, AtoM can also check for existing records that seem to match the descriptions you are about to import, and skip these records if desired - they will be reported in the Job details page of the related import job (see: Manage jobs for more information). This can be useful if you are uncertain if some of the records in your CSV have been previously imported - such as when passing records to a portal site or union catalogue. For more information on the criteria used during a CSV import to identify matches, see below, Matching criteria for archival descriptions. You have reviewed how the authority record matching behavior works above, and know what to expect with your import. If you have double-checked the above, you should be ready to import your descriptions. Click on the Import menu, located in the AtoM header bar, and select “CSV”. When you have configured your import options, click the “Browse” button to open a window on your local computer. Select the CSV file that you would like to import. Depending on the size of your CSV import, this can take some time to complete. Be patient! Remember, you can always check on the status of an import by reviewing the Job details page of the related import job - see: Manage jobs for more information. After your import is complete, AtoM will indicate that the import has been initiated. A notification at the top of the page will also provide you with a link to the Job details page of the related import job. 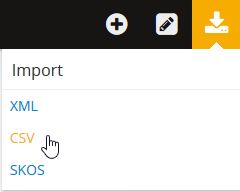 Alternatively, you can click the “Back” button in the button block at the bottom of the page to return to the CSV import page, or navigate elsewhere in the application. AtoM’s CSV import includes the ability to use the import to update existing descriptions in two different ways, depending on the outcome desired. After attempting to identify existing matches, AtoM can either delete the existing match and replace it with the matched row in the CSV import, or it can attempt to use the matched CSV row to update the description in-place with new data. Both options (and their limitations) will be explained further below, along with the additional import options available when importing updates. First AtoM will look for an exact match in the legacyID and the source_name value (for more information on source_name, see above: Legacy ID mapping: dealing with hierarchical data in a CSV). During a CSV import via the user interface, the default source name value stored will be the filename of the CSV. If no match is found on legacyID and source_name, then AtoM will look for an exact match on title, repository, and identifier. If there is no exact match on all of these 3 values, then the record is considered not to have a match. Depending on user settings during import, it will either import as new, or be skipped and reported in the Job details page. 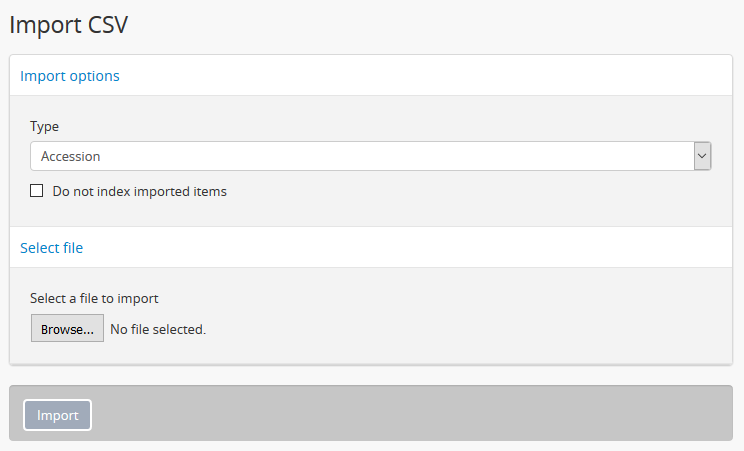 The default behavior when no match is found during an updates import is to import the record as a new description. However, AtoM does have an option in the user interface (and in the command-line options) to skip unmatched records. When this option is selected, any records that do not match existing descriptions will be ignored during the import, and reported in the console log shown on the Job details page of the related import job (see: Manage jobs for more information). This is recommended if you are intending to only import updates to existing records. If you are working with hierarchical data and you include a parentID value in a CSV import that cannot be matched on import (for example, the parent is not included in the CSV, and a matching parentID is not found in the keymap table duing import, AtoM will add the record as a top-level description. 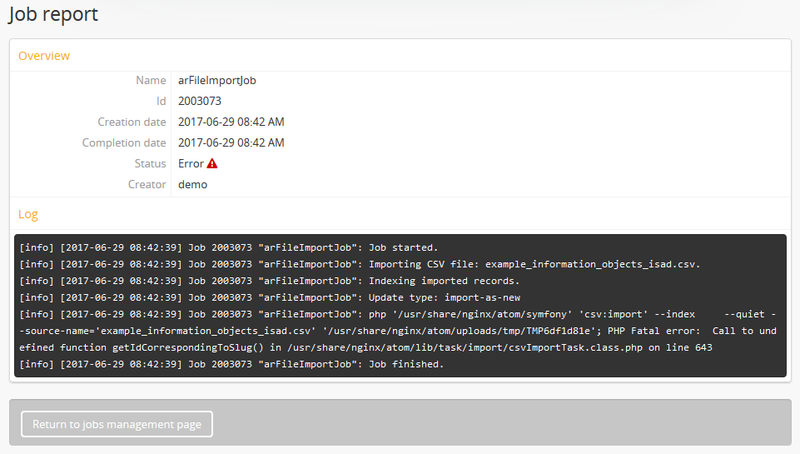 The console output shown on the Job details page of the related import job will say “attaching to root” for that record. If you don’t want this to happen, make sure you use the “Skip unmatched” option! You can also narrow the scope of the matching criteria to either records linked to a specific repository (i.e. an archival institution), or a specific archival unit (i.e. a top-level description such as a fonds or collection, etc.). To avoid contradictory options, AtoM will only allow one of these parameters to be specified at a time. These options are useful for ensuring that you are matching the correct descriptions before updating them - for example, when importing updates to the records of one specific institution into a multi-repository system. AtoM’s first option for updates allows you to use incoming CSV data as an update to existing descriptions. Whenever a match is found for an existing description, AtoM will use the data in the CSV to update the related field in place. If a column is left blank in the updates CSV, it will be ignored (it will not overwrite existing data by erasing it). To import a CSV as updates to existing descriptions, select the option “Update matches ignoring blank fields in CSV” from the “Update behaviours” drop-down menu on the CSV import page. AtoM can only update description fields that are stored in the primary information object database table using this method. This means that related entities (such as events, creators, access points, physical storage locations, etc.) cannot be deleted or updated with this method. You can add additional related entities, but the old ones will be left in place. There is code to prevent duplication however - so if you have left the same creator/event information as previously, it will be ignored. The one exception to this is updating the biographical or administrative history of a related authority record, which requires specifc criteria. See scenario 2B in the section above, Attempting to match to existing authority records on import. If you wish to make updates to these entitites or fields, consider using the “Delete and replace” update option instead - though be sure to read up on the behavior and limitations of that method as well! If a match is not found during the import, the default behavior is to import the CSV row as a new record. If you are only importing updates, we recommend clicking the checkbox for the “Skip unmatched records” - AtoM will then skip any unmatched CSV rows and report them in the console log shown on the Job details page of the related import job. Specific instructions on configuring the user interface for import are included below - see: Importing updates via the user interface. AtoM’s second update option allows you to identify matched descriptions during import, and then delete the matches prior to importing the CSV data as a new record to replace it. Note that only the matched archival description and its children are deleted during this process. Any related/linked entities (such as an authority record linked as a creator, subject/place/name/genre access points, linked accession records, physical storage locations, etc.) are not automatically deleted. If you want these fully removed, you will have to find them and manually delete them via the user interface after the import. To import an archival description CSV of records as replacements for existing descriptions in AtoM, select the “Delete matches and replace with imported records” option from the “Update behaviours” drop-down menu on the CSV import page. If a match is not found during the import, the default behavior is to import the CSV row as a new record. If you are only importing updates, you can click the checkbox for the “Skip unmatched records” if desired - AtoM will then skip any unmatched CSV rows and report them in the console log shown on the Job details page of the related import job. It is very difficult to use the “Skip unmatched records” option with a “Delete and replace” import when working with hierarchical data. Once a match is found for the top-level description (e.g. the root parent record), AtoM will then proceed to delete the original description and all of its children (e.g. lower level records). This means that when AtoM gets to the next child row in the CSV, it will find no match in the database - because it has already deleted the children - and the records will therefore be skipped and not imported. Unless you are only updating standalone descriptions (e.g. descriptions with no children), we do not recommend using the “Skip unmatched records” with the “Delete and replace” import update method. If you are using the “Delete and replace” method with hierarchical data - don’t use the “Skip unmatched records” option as well (see above, Delete matches and replace with imported records). If you are using the “Update matches ignoring blank fields in CSV” option, you have reviewed which entities and fields cannot be updated using this method (see above, Update matches in place). If you have double-checked the above, you should be ready to import your updates. AtoM will redirect you to the CSV import page. Make sure that the “Type” drop-down menu is set to “Archival description” . Select the type of update import you want to initiate. To update existing archival descriptions in place, select the option “Update matches ignoring blank fields in CSV” from the “Update behaviours” drop-down menu on the CSV import page. To delete existing matched archival descriptions and replace them with the data in your CSV, select the “Delete matches and replace with imported records” option from the “Update behaviours” drop-down menu on the CSV import page. AtoM’s default behavior when it cannot find a match during an update import is to import the CSV row as a new record. However, if you are only importing updates and don’t want to accidentally create new records when no match is found, you can check the “Skip unmatched records” checkbox. Any unmatched records will not be imported - instead, skipped records will be reported in the Job details page of the related import job (see: Manage jobs for more information). To improve the default matching behavior (described in detail above: Matching criteria for archival descriptions), you can provide further criteria to help AtoM find the correct match. You can limit the matches to either the holdings of a specific repository, or if you are updating a single archival unit, you can limit matches to a specific top-level description. To prevent contradictory options, these limiters are mutually exclusive - you cannot pick a repository AND a top-level description. When you have configured your import options, click the “Browse” button to open a window on your local computer. Select the CSV file that you would like to import as your update. Want to find your recently updated records? You can use the sort button located in the top-right hand side of the archival description browse page to change the results display to be ordered by “Most recent” if it is not already - that way, the most recently added or edited descriptions will appear at the top of the results. If you have come directly here after importing your descriptions, they should appear at the top of the results. If any warnings or errors are encountered, AtoM will display them on Job details page of the related import job. Generally, errors will cause an import to fail, while warnings will be logged but will allow the import to proceed anyway. Errors can occur for many reasons - please review the checklist above for suggestions on resolving the most common reasons that CSV import updates fail. The Events CSV import can be used to supplement the types of events that associate an actor (represented in AtoM by an authority record) and an information object (represented in AtoM by an archival description. In AtoM’s data model, an archival description is a description of a record, understood as the documentary evidence created by an action - or event. It is events that link actors to descriptions - see Entity types for more information, and see the section above for more information on actors and events in the archival description CSV: Creator-related import columns (actors and events). The Events CSV can be useful for adding other event types to relate actors to descriptions, such as publication, broadcasting, editing, etc. At this time, the events import will only work with archival descriptions that have been created via import. The target description was imported using either the command line or the CSV import in the user interface - events import will not work with descriptions created in the user interface. The events CSV file should be renamed to match the source_name value of the previous import. See above for more information, Legacy ID mapping: dealing with hierarchical data in a CSV. If you are referencing existing authority records already in AtoM, make sure that the name used in the actorName column matches the authorized form of name in the authority record exactly. See above for more information on how AtoM attempts to identify authority record matches: Attempting to match to existing authority records on import. If you have double-checked the above, you should be ready to import your events. AtoM will redirect you to the CSV import page. Make sure that the “Type” drop-down menu is set to “Event”. Click the “Browse” button to open a window on your local computer. Select the events CSV file that you would like to import. You can import repositories (i.e. archival institutions into AtoM as well. At this time, there is not support for importing all repository record data fields into AtoM. However, most fields are supported. The legacyID column is a required field, used only internally. Add a unique numeric value to this column. The legacyID can be used to assist in matching multiple CSV import types. Further information is provided in the section on legacy ID mapping above - see: Legacy ID mapping: dealing with hierarchical data in a CSV. The uploadLimit column allows a user to set a default upload limit for a repository at the time of import. This value should be a number, representing Gigabytes. For more information on the use of respository upload limits in AtoM, see: Set digital object upload limit for an archival institution. Almost all other fields are drawn directly from the archival institution edit template in AtoM, which is based upon the International Council on Archives’ International Standard for Describing Institutions with Archival Holdings (ISDIAH). For more information on the use of each field and a link to the related standard, see: ISDIAH edit template. Generally, fields in the CSV template have been named in a fairly obvious way, translating a simplified version of the field name in our data entry templates into a condensed camelCase. For example, ISDIAH 5.3.2, Geographical and cultural context (in the Description Area) becomes geoCulturalContext in the CSV template. Consult the ISDIAH page for further help with fields. The culture column indicates to AtoM the language of the descriptions being uploaded. This column expects two-letter ISO 639-1 language code values - for example, “en” for English; “fr” for French, “it” for Italian, etc. See Wikipedia for a full list of ISO 639-1 language codes. You have prepared your repository CSV data following the recommendations in the section above, Prepare archival institution records for CSV import. AtoM will redirect you to the CSV import page. Make sure that the “Type” drop-down menu is set to “Archival institution”. For new repository records, make sure that the “Update behaviors” drop-down menu is set to “Ignore matches and create new records on import”. AtoM can also double-check to see if a repository with an authorized form of name that exactly matches your import(s) already exists, and skip these records during import if desired. To skip any exact matches, check the “Skip matched records” checkbox. AtoM will report any skipped rows in the console output provided on the Job details page of the related import job - see: Manage jobs for more information. [info] [2018-01-01 14:06:04] Job 2003115 "arFileImportJob": Row 1: Matching record found for "Example Archives", skipping. Click the “Browse” button to open a window on your local computer. Select the Repositories CSV file that you would like to import. AtoM’s CSV import includes the ability to use the import to update existing archival institution in two different ways, depending on the outcome desired. After attempting to identify existing matches, AtoM can either delete the existing match and replace it with the matched row in the CSV import, or it can attempt to use the matched CSV row to update the repository record in-place with new data. Both options (and their limitations) will be explained further below, along with any additional import options available when importing updates. When importing updates, AtoM will attempt to match against the existing repository records using the authorized form of name of the repository. This means that it is not currently possible to use the update functionality to change the name of your repository record. If the authorized form of name is edited then no match will be found. By default, when no match is found, AtoM will proceed to create a new record instead. If you do not want this to happen, you can click the “Skip unmatched records” checkbox. When no matches are found with this option checked, AtoM will skip the unmatched CSV row and report it in the console output found on the Job details page of the related import job - see: Manage jobs for more information. AtoM’s first option for archival institution updates allows you to use incoming CSV data as an update to existing repository records. Whenever a match is found for an existing repository (based on the authorized form of name), AtoM will use the data in the CSV to update the related field in place. If a column is left blank in the updates CSV, it will be ignored (it will not overwrite existing data by erasing it). To import a CSV as updates to existing repository records, select the option “Update matches ignoring blank fields in CSV” from the “Update behaviours” drop-down menu on the CSV import page. If you wish to update these fields, you might want to either make the changes manually, or consider the “delete and replace” method. However, please read the details below on the limitations of Delete and replace as well before proceeding! See below for step-by-step instructions on importing repository updates via the user interface. AtoM’s second update option allows you to identify matched repositories during import, and then delete the matches prior to importing the CSV data as a new record to replace it. Note that only the matched archival institution record is deleted during this process. Any related/linked entities (such as an authority record linked as being maintained by the repository, Thematic area or other repository access points, and linked archival descriptions) are not automatically deleted. If you also want these fully removed, you will have to find them and manually delete them via the user interface after the import. Once the original matched repository record has been deleted, the CSV import proceeds as if the record is new. That is to say, just as AtoM does not automatically delete entities related to the original archival institution, it also not automatically re-link previously related entities. This means that if your archival institution record is linked to descriptions, using the “Delete and replace” method will unlink all descriptions - these will not be automatically re-linked with the new import! We recommend you only use the “Delete and replace” method with repository records that are not currently linked to other entities. To import an archival institution CSV of records as replacements for existing repositories in AtoM, select the “Delete matches and replace with imported records” option from the “Update behaviours” drop-down menu on the CSV import page. You have reviewed the sections above on each of the update behaviors and their limitations, and know what to expect. AtoM will redirect you to the CSV import page. Make sure that the “Type” drop-down menu is set to “Archival institution” . To update existing archival institutions in place, select the option “Update matches ignoring blank fields in CSV” from the “Update behaviours” drop-down menu on the CSV import page. To delete existing matched archival institutions and replace them with the data in your CSV, select the “Delete matches and replace with imported records” option from the “Update behaviours” drop-down menu on the CSV import page. The authority record import tool allows you to import data about people, familiies, and organizations. In addition to importing data detailing these entities, the tool also allows the simultaneous import of supplementary data (in separate CSV files) on how these entities relate to each other and alternate names these entities are known by. For more information on how the archival description import manages the identification and linking of existing authority records, see: Attempting to match to existing authority records on import. A brief explanation of the main fields in authority record CSV template is included below. The typeOfEntity column maps to the entity type terms recommended in ISAAR-CPF 5.1.1 Type of Entity, and maintained in AtoM in the Actor Entity Types taxonomy. This column expects one of three recommended values - Person, Corporate body, or Family. Almost all other fields are drawn directly from the authority record edit template in AtoM, which is based upon the International Council on Archives’ International Standard Archival Authority Record for Corporate Bodies, Persons and Famillies (ISAAR-CPF). For more information on the use of each field, see the Data entry page on the ISAAR-CPF template and consult the related standard. See also: Authority records. Most fields in the CSV template have been named in a fairly obvious way, translating a simplified version of the field name in our data entry templates into a condensed camelCase. For example, ISAAR 5.2.1, Dates of Existence (in the ISAAR Description Area) becomes datesOfExistence in the CSV template. Consult the ISDIAH data entry page for further help with fields. The history column, which conforms to ISAAR 5.2.2, will appear as the Administrative or Biographical history in any archival description to which an authority record is linked. For more information on how AtoM manages authority records, see: Authority records. Some fields available in the user interface (such as alternative forms of name, as well as the Relationships area, where you can link one authority record to another) are not available in this CSV template. However, two additional CSV templates can be imported at the same time by a system administrator via the command-line interface to add this information. For more information, see: Importing authority records. You’ve reviewed the instructions in the section above on preparing your CSV file and have made sure it conforms to the recommendations. See: Prepare authority records for CSV import. AtoM will redirect you to the CSV import page. Make sure that the “Type” drop-down menu is set to “Authority record”. For new authority records, make sure that the “Update behaviors” drop-down menu is set to “Ignore matches and create new records on import”. AtoM can also double-check to see if an authority record with an authorized form of name that exactly matches your import(s) already exists, and skip these records during import if desired. To skip any exact matches, check the “Skip matched records” checkbox. AtoM will report any skipped rows in the console output provided on the Job details page of the related import job - see: Manage jobs for more information. [info] [2018-01-01 15:01:04] Job 2003116 "arFileImportJob": Row 1: Matching record found for "Jane Doe", skipping. Click the “Browse” button to open a window on your local computer. Select the Authority record CSV file that you would like to import. AtoM’s CSV import includes the ability to use the import to update existing authority records in two different ways, depending on the outcome desired. After attempting to identify existing matches, AtoM can either delete the existing match and replace it with the matched row in the CSV import, or it can attempt to use the matched CSV row to update the authority record in-place with new data. When importing updates, AtoM will attempt to match against the existing authority records using the authorized form of name of the existing actor (a.k.a. authority record). This means that it is not currently possible to use the update functionality to change the name of your authority record. If the authorized form of name is edited then no match will be found. If you have previously linked your authority records to a repository (for more information, see: Link an authority record to a repository as its maintainer), then it is possible to increase the likelihood of a successful match on import by limiting the update to only those authority records associated with a particular repository. AtoM’s first option for authority record updates allows you to use incoming CSV data as an update to existing authority records in place. Whenever a match is found for an existing authority record (based on the authorized form of name), AtoM will use the data in the CSV to update the related field in place. If a column is left blank in the updates CSV, it will be ignored (it will not overwrite existing data by erasing it). To import a CSV as updates to existing authority records, select the option “Update matches ignoring blank fields in CSV” from the “Update behaviours” drop-down menu on the CSV import page. Note as well that any existing access point data (for example, the Occupations access point on the authority record) cannot be modified or removed via this method - though new access points can be added via this “Match and update” approach. AtoM’s second update option allows you to identify matched authority records during import, and then delete the matches prior to importing the CSV data as a new record to replace it. Note that only the matched authority record is deleted during this process. Any related/linked entities (such as a repository linked as the authority record’s maintainer, other authority records linked via a relationship, Occupation access points, and linked archival descriptions) are not also automatically deleted. If you also want these fully removed, you will have to find them and manually delete them via the user interface after the import. 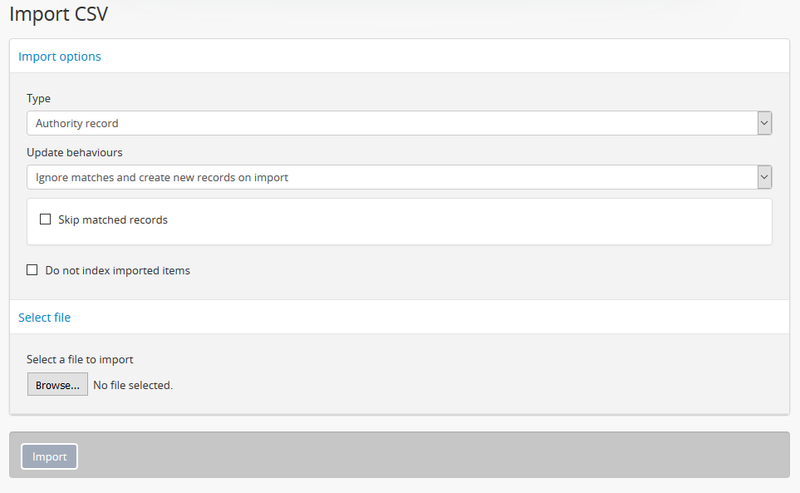 Once the original matched authority record has been deleted, the CSV import proceeds as if the record is new. That is to say, just as AtoM does not automatically delete entities related to the original archival institution, it also not automatically re-link previously related entities. This means that if your authority record is linked to descriptions, a repository, or other authority records, using the “Delete and replace” method will unlink all related descriptions, repositories, and authority records - these will not be automatically re-linked with the new import! We recommend you only use the “Delete and replace” method with authority records that are not currently linked to other entities. You are aware that using the “Delete and replace” update option will remove the links between all related entities (descriptions, other authority records, repositories, access points, etc) - though it will not delete these entities. To update existing authority records in place, select the option “Update matches ignoring blank fields in CSV” from the “Update behaviours” drop-down menu on the CSV import page. To delete existing matched authority records and replace them with the data in your CSV, select the “Delete matches and replace with imported records” option from the “Update behaviours” drop-down menu on the CSV import page. To improve the default matching behavior (based on the authorized form of name of the authority record), you can provide further criteria to help AtoM find the correct match. If you have linked your authority record(s) to a repository as the maintainer, then you can limit the matches to either the authority records of a specific repository. To learn more about linking an authority record to a repository, see: Link an authority record to a repository as its maintainer. To limit your matches to the holdings of a specifc archival institution, use the drop-down menu to select the name of the related repository. If you previously created your repository record via CSV import, it will sometimes not appear at first in the drop-down menu. Try to begin typing the first letters of the target repository name when your cursor is on the Limit matches drop-down to see if it appears. 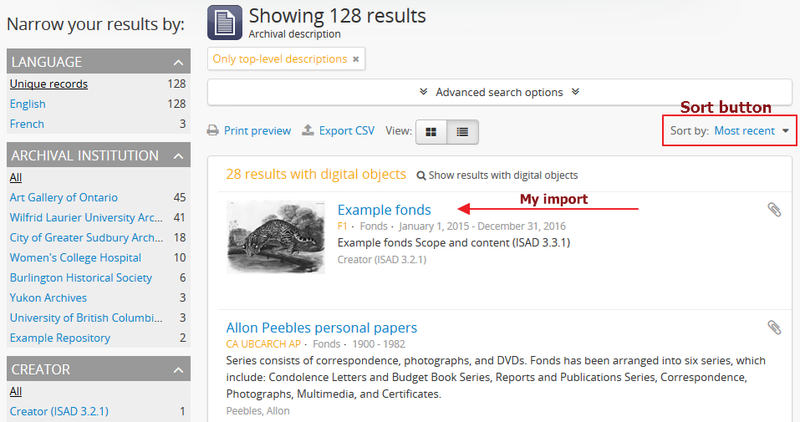 The accession record import tool allows you to import data about your accessions. Additionally, when importing descriptions as well, you can use the subsequent archival description CSV import to create a link between your accession records and your descriptions, by adding an accessionNumber column in the archival description CSV and populating it with the exact accession number(s) used during your accessions data import. Alternatively, you can use the qubitParentSlug column to link existing descriptions in AtoM to new or updated accessions records via your import - more details below. Below you’ll find brief data entry guidelines for preparing a CSV file of accessions data for import. The acquisitionDate column expects date strings to be formatted according to the ISO 8601 date format standard - that is, YYYY-MM-DD. To link incoming accession records to existing archival descriptions, you can add a column named qubitParentSlug. This column will behave similarly to the qubitParentSlug column in the archival description CSV templates (described above). To link an accession row in your CSV to an existing description in your AtoM instance, simply enter the slug of the target description in the qubitParentSlug column. AtoM will locate the matching description and link the two during import, similar to how an accession created through the user interface can be linked to a description (see: Link an accession record to an archival description). Most fields in the CSV template have been named in a fairly obvious way, translating a simplified version of the field name in the AtoM user interface into a condensed camelCase in our data entry. For example, the “Immediate source of acquisition” field in the user interface is represented in the CSV template as the sourceOfAcquisition column. acquisitionType - listed in the user inteface as “Acquisition type.” Default values are: Deposit, Gift, Purchase, Transfer. resourceType - listed in the user interface as “Resource type.” Default values are: Public transfer, Private transfer. processingStatus - listed in the user interface as “Processing status.” Default values are: Complete, Incomplete, In-Progress. processingPriority - listed in the user interface as “Processing priority.” Default values are: High, Medium, Low. The creators column can be used to add the name(s) of the creator of the accession materials. For now, only creation events are supported, so the the eventTypes value should always be Creation. eventDates, eventStartDates, and eventEndDates columns can be used similarly to those in the archival description CSV templates - The eventDates field will map to the free-text display date field in AtoM, where users can use special characters to express approximation, uncertainty, etc. (e.g. [190-? ]; [ca. 1885]), while eventStartDates and eventEndDates should include ISO 8601-formatted date values (YYYY-MM-DD, YYYY-MM, or YYYY). If there are multiple creators/events associated with the accession, these fields can all accept multiple values, separated using the pipe | character. When using pipe-separated values to add multiple creators/events, values will be matched 1:1 across all related rows (creators, eventTypes, eventDates, eventStartDates and eventEndDates). This means that even if you wish to leave the values for one creator blank (say the end date for creator 1 of 2), you must still pipe the field when adding the second creator’s endDate values, or else they will be matched up with creator 1! The culture column indicates to AtoM the default language of the accession records being uploaded. This column expects two-letter ISO 639-1 language code values - for example, “en” for English; “fr” for French, “it” for Italian, etc. See Wikipedia for a full list of ISO 639-1 language codes. You have prepared your CSV data in accordance with the accession CSV guidance provided above - Prepare accession records for CSV import. AtoM will redirect you to the CSV import page. Make sure that the “Type” drop-down menu is set to “Accession”. If any warnings or errors are encountered, AtoM will display them on Job details page of the related import job. Generally, errors will cause an import to fail, while warnings will be logged but will allow the import to proceed anyway. Errors can occur for many reasons - please review the checklist above for suggestions on resolving the most common reasons that CSV imports fail.